Fall colors in eastern Quebec are undeniably stunning, but the nip in the air suggests it's time to head south. On our way back to winter in Texas, Marita and I always try to find places to stop where there is music - preferably something new and stimulating. 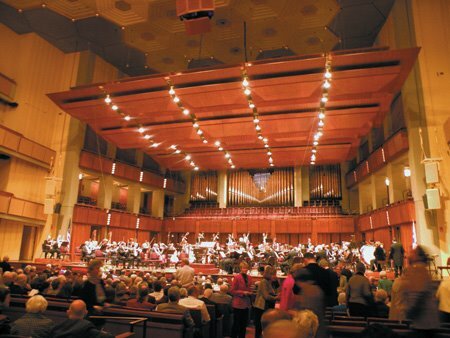 This year I chose Washington, D.C. where Hungarian conductor Ivan Fischer is beginning his tenure as principal conductor of the National Symphony Orchestra at the Kennedy Center, and Nashville, Tennessee where the new concert hall is drawing rave reviews and where Nicaraguan-born Giancarlo Guerrero is giving his first concerts as music director designate. I have often visited the Kennedy Center and I continue to be impressed by its prime location on the Potomac alongside some of the best-known presidential memorials, its architectural beauty and its wonderful acoustics. I can still recall the sounds of the Berlin Philharmonic under Karajan and the Vienna Philharmonic under Bernstein in this remarkable hall. On the strength of the Mahler Third Symphony performance I heard, Ivan Fischer and the National Symphony belong in that distinguished company. I have heard The Mahler Third live and on records many times, but what I heard this night forced me to rethink everything I thought I knew about this massive work. The first movement – “Pan’s Awakening; Summer Marches In” - simply knocked me sideways. At times I thought I had inadvertently come upon an unknown masterpiece by Charles Ives. Or perhaps it was by Messiaen. Ives came to mind because of the inspired farrago of hymn tunes, folk songs, military and funeral marches that erupted on the stage of the Concert Hall at the Kennedy Center. It wouldn’t have surprised me to hear “Columbia, the gem of the ocean” blaring out amid Mahler’s tumult. Fischer didn’t change any notes, of course, but he brought out a freedom and joy that I had never heard before. And Messiaen? The first movement of Mahler’s Third is teeming with bird calls, but we rarely hear them as such; they are generally played too strictly and too seriously. Perhaps Fischer had encouraged his players to find the character of each bird call and project the sound as if outdoors! This first movement is admittedly long and repetitious, but in this performance I wished it could have gone on forever. And I haven’t yet mentioned Craig Mulcahy’s powerful trombone solo. In fact, the entire trombone section was magnificent. By the end of the first movement, I was convinced that I was witnessing a great conductor at work and that he had probed Mahler’s genius as few others have ever done. But there was more. Hendrickson’s Otherworldly Posthorn Solo Sublime! The second movement minuet had a lovely grace and charm and the third movement moved from charming to boisterous and then with the posthorn solo into the sublime. Steven Hendrickson played the solos offstage as if from another world. I thought at first he was too far away but Fischer had the accompanying strings playing so softly that Hendrickson’s horn was never covered for a moment. And after all, the solo part is marked ppp and Mahler intended it to be barely audible. In the fourth movement – “What Man Tells Me” – Mahler introduces the human voice for the first time in the symphony with a text from Nietzsche. According to Mahler’s wife Alma, Mahler hated Nietzsche and rejected his disdain for the traditional concept of God. The inclusion of a Nietzsche text in this symphony, however, suggests otherwise. Mahler’s concept of God was far from traditional and although he never lost his yearning for life after death and some ultimate meaning to life itself, he remained to the end it seems, tortured by the pain and suffering all around him. Although Birgit Remmert sang the Nietzsche text with poise and understanding, it was during this delicately-scored movement that I began to wonder about the acoustics in the hall. Up to this point every timbre had registered with clarity and the orchestra had had remarkable presence; how could it be that two horns playing softly now could so easily overwhelm the contralto soloist? In the fifth movement – “What the Angels Tell Me” – we moved to territory that Mahler was to exploit more fully in his Fourth Symphony: a child’s view of heaven. The University of Maryland Concert Choir and the Children’s Chorus of Washington – both singing from memory – were exuberant and accurate. The last movement – “What Love Tells Me” – is purely instrumental and one of Mahler’s greatest slow movements. How slow? Well, if you were brought up on Bernstein’s Mahler ‘as slow as possible’ and then slower! Fischer would have none of that. He started off at what was clearly a walking tempo knowing that he had a long way to go. He also paid due regard for Mahler’s dynamic markings – the strings start the movement pp and through much of the movement rarely rise about it. Plenty of time to pull back the tempo later and the climactic moments are all the more effective for being infrequent and carefully prepared. Fischer’s approach was certainly convincing and he found the sadness in the music as well as any conductor. By the way, the passage in the final movement that I find especially affecting occurs at number 26 in the score with a quiet passage for three trumpets and two trombones against very soft sustaining chords in the strings. I can’t help imagining a graveside tribute to a fallen comrade with elements common to New Orleans funeral processions. Mahler’s brass writing is so poignant it can’t help but break your heart. After that, the music builds inexorably toward a final peroration. Life goes on. We struggle. We shall overcome. Fischer seemed to vary the tempo with uncanny accuracy and inspired his players to give everything they had - and yet it was not a ‘free for all’. Fischer kept Mahler’s instructions in mind to the end. While two timpanists and the rest of the orchestra are putting out a truly frightening volume of sound, Mahler instructs the conductor to make sure the trumpets carry over the whole orchestra. And they did. One final point about this performance: Mahler was very specific about how the last chord was to be played, yet few conductors pay any attention to these markings. Fischer did. Mahler writes a fermata (hold) over the last chord and the word Lange (long). But he also writes something else: ohne Diminuendo, Nicht abreissen (without diminuendo and no tearing off). What does he mean with this strange instruction? Not easy to say. Fischer took it to mean that the sound was to be sustained at the same volume and then terminated without any accent or abruptness. This is a difficult concept to grasp let alone to realize in performance, but from his gestures it was obvious that Fischer and his players had discussed it and were trying hard for the effect requested by the composer. Bravo! Ivan Fischer created the Budapest Festival Orchestra in 1983 and he and this band of Hungarian all-stars have been stunning audiences and record collectors all over the world. If you live on or near the U.S. East Coast you’ll get a chance to hear them next January. From Jan 23-31 they’ll be playing at Carnegie Hall and in four different cities in Florida. On records you should investigate their recent recording of Mahler’s Symphony No. 2 and for imaginative scholarship it is hard to beat their fascinating recording of Brahms’ Hungarian Dances. This fall Ivan Fischer is beginning a two-year tenure as ‘principal conductor’ of the National Symphony Orchestra. Curiously, just a month ago, the NSO announced that it had appointed Christoph Eschenbach as its new ‘music director’ starting in 2010. 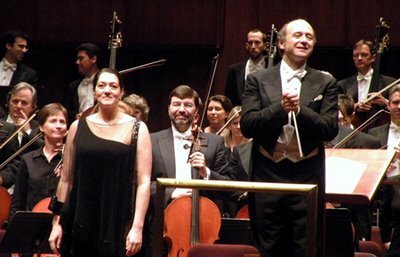 Fortunately for audiences, the rapport between Fischer and the NSO is palpable. Why did Fischer not get the music director position? Perhaps he didn’t want it and all the non-musical responsibilities that go with the job. Whatever the reason, enjoy Fischer and the NSO while you can. If the Mahler Third is any indication, they are going to be giving some terrific concerts together for at least the next two seasons. For classical music lovers, the combination of Fischer and the NSO is reason enough to head for Washington. And how about the Washington Opera? It’s headed by Placido Domingo these days and he’s mounting some exceptional productions in the Opera House at the Kennedy Center. Nor does Washington lack for fine dining experiences, and some of these can be had in the Kennedy Center itself. Before the Mahler, we visited the KC Café on the Terrace Level and enjoyed some great pasta made to order by a chef at one of the many gourmet food stations. Prefer table service? Head for the fancier Roof Terrace Restaurant! On this visit we stayed across the Potomac in Virginia. Alexandria is one of the oldest towns in the country and its center is filled with ancient houses lovingly restored, and with dozens of quaint shops and restaurants. Few tourists seem to venture this far from the monuments and museums, but Alexandria is a charming residential/retail oasis only about twenty minutes by car or subway from downtown Washington and places like the Kennedy Center. News & views on the Nashville Symphony’s new Schermerhorn Concert Hall and Nicaraguan-born conductor Giancarlo Guerrero in my next blog!